In a food processor, whirl flax seeds with warm water until you have a "gooey mess". Add milk and vegetable oil and give it another spin to mix with the flaxseed. Combine dry ingredients; flour, oats, salt, baking powder, nutmeg, cinnamon, sweetener (like Stevia) and walnuts, in a large mixing bowl. Slowly stir the wet ingredients into the dry. Fold in the chopped apple. Fill muffin cups 1/2-3/4 full with batter. Bake for 15 - 20 minutes or until a knife comes out clean. 741 members have added this recipe to their cookbook. @NoSugarGoal It seems that you might be a little confused on what glycemic load and what the glycemic index is for. What you're describing is a carb-free diet and not a "sugar-free" diet. This recipe is fine for people wanting a low GI food, granted I wouldn't pound them down every day if you're trying to lose fat. Maybe once a week. In addition to the oats and apple, both low GI foods, you also have the almond milk, which the fat will also slow down digestion and not cause insulin spikes. They were real good. will make them a lot. I used macadamia nut oil instead of vegetable. Adds healthier fats than the vegetable or canola oil. Also gives a hint of butteriness. The directions call for walnuts but the ingredient list does not call for them. If you add them just beware of your nutritional content difference. 3pts for 1 muffin, not bad. Seems that I wouldn't be full on that alone. Paired with something for 1 or 2pts could make for a filling breakfast. A light and lovely muffin, especially for the fall. My favorite on the run treat, a whole wheat muffin made with walnuts and cranberries. 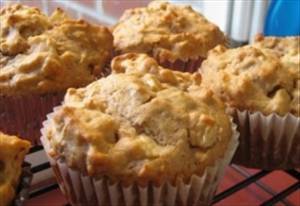 There are 120 calories in 1 serving of No Sugar Oatmeal Apple Muffins. Calorie break-down: 42% fat, 49% carbs, 9% protein.